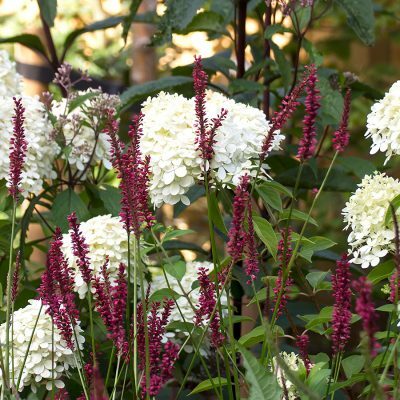 Garden design and planting in sussex. My clients house stood on a plinth in the center of their plot, surrounded by trees and a lot of bumpy lawn. The key was to make the house part of the garden and try to level the lawn. The first job was to remove a large conifer hedge to the side of the property. This shaded the house and was gradually encroaching on the garden as it got wider…and wider. Care was taken to remove all the roots and import good topsoil. The hedge was replaced with a much more suitable beech hedge. 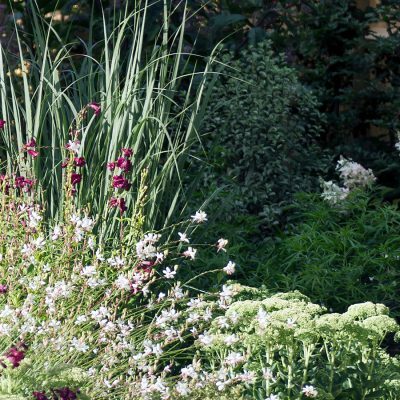 The side garden is now a path through dramatic planting of grasses and shrubs leading to a deck at the bottom of the garden. 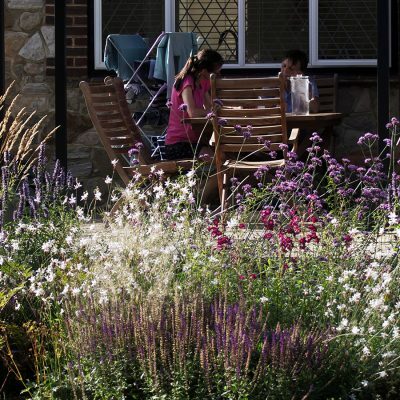 The raised patios are now surrounded by colourful perennial planting that comes to life in the summer and autumn. 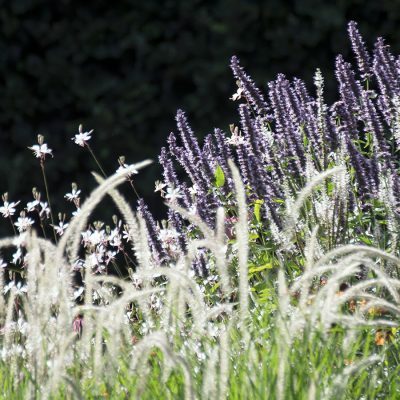 Drifts of osmanthus will be clipped to undulating, curvaceous hedges to soften the hard landscaping year round and provide a dark backdrop to the perennials and grasses. All the planting is irrigated and heavily mulched. The soil is fantastic but quite free draining, so the extra water and protection has really helped the garden thrive. The planting is under 1 year old. We stripped and regarded the lawn area and re laid turf. This project is ongoing and the next phase will be to finish beyond the lawn. Planting will begin this autumn. 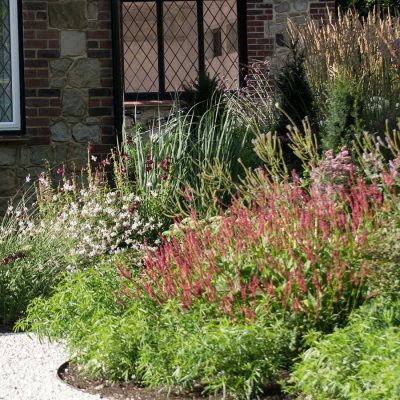 This project was all about the garden planting design. My clients house stood on a plinth in the centre of their plot, surrounded by trees and a lot of bumpy lawn. The key was to make the house part of the garden and try to level the lawn. The first job was to remove a large conifer hedge to the side of the property. This shaded the house and was gradually encroaching on the garden as it got wider…and wider. Care was taken to remove all the roots and import good topsoil. The hedge was replaced with a much more suitable beech hedge. 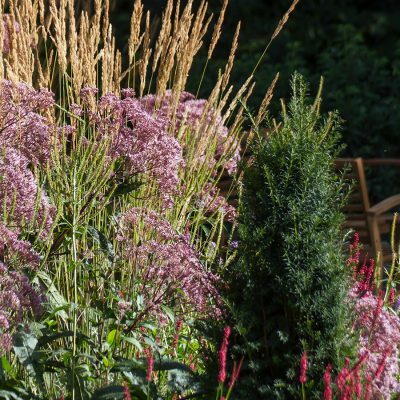 The side garden is now a path through dramatic planting of grasses and shrubs leading to a deck at the bottom of the garden. We stripped and regarded the lawn area and re laid turf. This project is ongoing and the next phase will be to finish beyond the lawn. The remaining garden planting will begin this autumn.